Thursday April 3rd 1924 Bro Robs birthday. I wrote to Ida & Lydia. I rested awhile in afternoon and later walked down to call on Mrs Harmon to tell of my going to Portsmouth. To a church dinner at noon. Evening to church with Mattie. Friday April 4th 1924 I was reading part of the forenoon. My throat in nearly well. I walked down to call on Mrs Esker in afternoon. Mattie down town. The evening at home. wrote Mrs Falk. Friday April 5th 1924 A letter from Ida. I wrote to her and Aunt Sarah. The weather was not fit for me to be out all day. Matties Aunt was here for supper and part of the evening. Sunday April 6th 1924 I did not feel like getting out. I read some and packed my trunk and sent to the depot late in the afternoon. Mattie went to church in the evening. Monday April 7th 1924 John took me to the 6.20 train was delayed by freight wreck so only had time to change cars in Cincinnati. A tiresome ride to Indianapolis. Went directly to Claypool Hotel and rested. Took a walk before supper. In evening wrote Mattie, Hattie & Birdie. 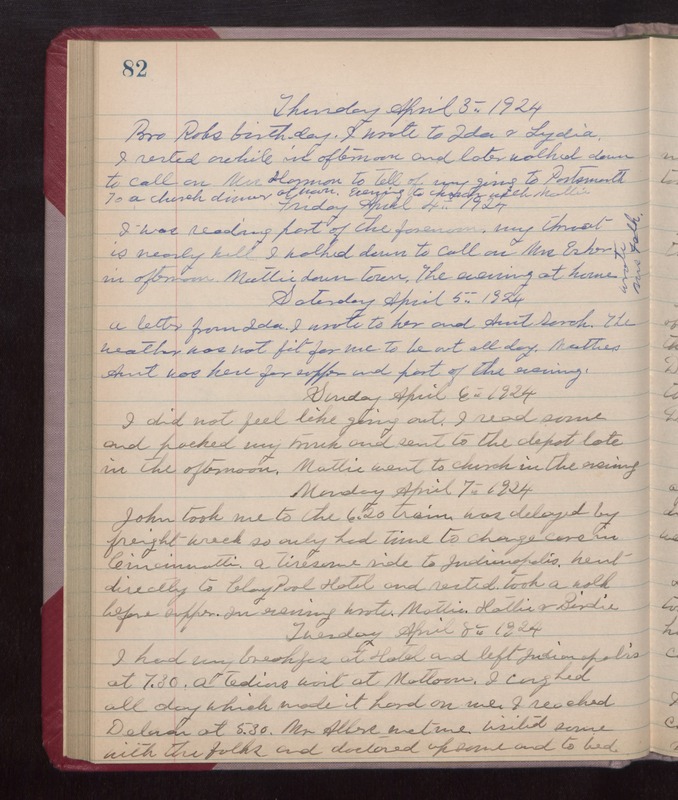 Tuesday April 8th 1924 I had my breakfast at Hotel and left Indianapolis at 7.30. a tedious wait at Mattoon. I coughed all day which made it hard on me. I reached Delavan at 5.30. Mr Albers met me. Visiting some with the folks and doctored up some and to bed.